When I posted the story below on May 31, 2010, I did not realize that Bill Cooper's video showing the digitized and computer enhanced Zapruder film provided to Bill by Japanese sources was once again available on the Internet. I only saw it once many years ago. When I searched for it a few years ago, I couldn't find it and I assumed that our government "vacuum and clean up" crews had permanently removed it, but I stumbled upon it a few days ago while looking for other videos concerning the JFK assassination. I've embedded the video below. This is the video to which I allude in contesting Jim Marrs' outrageous claims that Bill Cooper didn't know what he was talking about when he said that driver William Greer had shot Kennedy at point blank range using a special, custom-made assassin pistol built by the CIA. In this video, you will see the slow motion scenes of Greer turning towards Kennedy, place the gun on his right shoulder (holding it with his left hand) and causing Kennedy's brains to explode when he squeezed the trigger in Zapruder frame 313. The first few minutes of the video are a retrospective of Kennedy's career as President (note carefully, the words Kennedy uses in cautioning the public to become wary of the government's gradual encroachment upon Constitutional liberties). Bill Cooper starts talking at the 4:30 minute mark. The entire video is 46 minutes long. I might suggest that you read my article first and then come back to watch the video to more completely understand the gravity of Marrs's obfuscation and misdirection. In doing a Google search under the name "Jim Marrs", I couldn't find even one article (besides mine, #75 on a Sep. 26, 2010 Google search of 100 items) that criticized Marrs as a gatekeeper, yet his disparaging comments about Bill Cooper's ACCURATE assertion that Greer shot Kennedy, buttressed by this unambiguous video, should tell you EVERYTHING about Jim Marrs. I should also emphasize in this update that Bill Cooper initially discovered that William Greer had shot JFK from Top Secret Navy documents discovered in an admiral's vault in 1973 while attached to the Office of Naval Intelligence (ONI), working under Admiral Bernard A. Clarey, Commander in Chief of the US Pacific Fleet (CINCPACFLT) from 1970-1973. Bill later saw a video made by Lars Hanson in 1988 called Dallas Revisited which describes Greer shooting Kennedy using a black and white version of the Zapruder film. Bill sent a copy of this video to Japan where a digitized, computer enhanced version was made and sent back to Bill. In the last 5 minutes of the video, Bill talks about not getting side-tracked by "agent-teurs", which I think refers to agent provacateurs, who in this case, refers to individuals who inspire debate or obfusacation by introducing misleading or false clues. Bill cites the case of Robert J. Groden who has published a number of books on the photographic record of the JFK assassination. In reference to Greer, Bill said that Groden claimed that his analysis of the JFK assassination photos proves that Greer's hands never left the driver's wheel. If you read the claims made by Jim Marrs in the May 30, 2010 article posted at rense.com, Jim Marrs makes the exact same claim about Greer's hands never leaving the driver's wheel. What does that tell you about Jim Marrs? Jim Marrs' insipid attempt to discredit the history-changing research of William Cooper and to debunk Cooper's scoop-of-the-century story obtained from a careful viewing of the Zapruder film, that CLEARLY and DIFINITIVELY shows William Greer, JFK's Limo Driver, firing a .45 cal automatic pistol resting on his right shoulder directly at Kennedy's head at the very moment that Kennedy is seen clutching his throat having just been hit with another bullet from ground level, probably the Grassy Knoll area, is BEYOND contemptible. Marrs' outrageous attempt to smear Cooper's discovery tells me much more about Jim Marrs than it does of William Cooper. Despite all of Marrs' books and acclaimed fame and adulation as a fearless journalist out to tell the "real" story about the conspiracy to assassinate Kennedy, Marrs is obviously a GATEKEEPER, of the same slick species seen in Noam Chomsky. Marrs employs ALL of the standard smear tactics used by debunkers to erect the shaky scaffolding upon which his disingenuous assertions rests. For starters, Marrs informs us with an authority bordering on disdain, that Cooper's "theory" about Greer shooting Kennedy is "not true", because "it simply didn't happen". Right (I suppose we should be grateful that he just didn't stop right there and sign his name to the essay). Then comes the best part: five paragraphs of absolute mush and slop masquerading as evidence to support HIS thesis (dare I say "theory"?). 1. On the same day of the assassination, Zapruder was taken to a Kodak processing lab in Dallas in a police cruiser accompanied by a reporter named Harry McCormack and a SECRET SERVICE Senior-Agent-in-Charge by the name of Forrest Sorrels to have his film developed. The Zapruder film was developed and three copies were made of the original. The original film was sold to Time-Life (controlled by Henry Luce, CIA asset) and was sent to their Chicago office on November 23, 1963 (Time-Life initially paid Zapruder $50,000 for the print rights, but two days later paid Zapruder $150,000 for ALL reproduction rights). Secret Service Agent Sorrels picked up two of the three copies. One went to the FBI and the other one was immediately dispatched to Washington for analysis by the National Photographic Interpretation Center (NPIC) who worked through the night with the Secret Service to prepare enlarged photographic stills and a briefing for John McCone, director of the CIA (having replaced Allen Dulles who Kennedy dumped in 1961) the following day. The third copy was kept by Zapruder (who died in 1970). This copy was never seen by the public. A tiny portion of the public got to see a copy of the Time-Life Zapruder film for the first time at the 1969 trial of Clay Shaw. Prosecutor Jim Garrison had successfully subpoenaed a copy from Time-Life and quietly arranged for many copies to be leaked to journalists and interested investigators. I'm convinced, however, that the copy which Garrison had obtained from Time-Life was already doctored to obscure the facts being discussed here. 2. Marrs' statement that William Cooper's "flawed" notion that Greer had shot Kennedy came about as a result of Cooper viewing a "bad 4th or 5th generation copy of the Zapruder film". But don't worry, gatekeeper Marrs has studied "first- generation clear prints of the Zapruder film" and being the acclaimed and feted expert that he is on the Kennedy assassination, tells us with certitude that "at no time did his two hands [referring to limo driver William Greer] leave the steering wheel of the limousine." 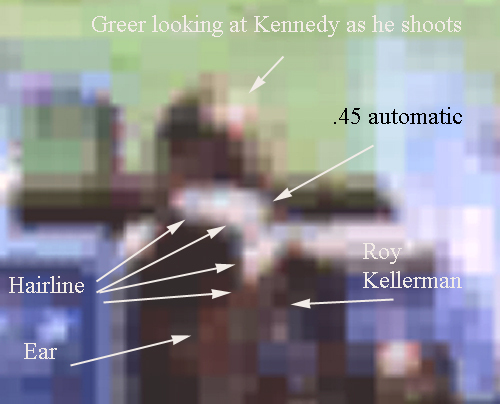 The link provided below includes an enlargement of Greer which shows his left hand holding the gun as he places it on his right shoulder before shooting Kennedy. 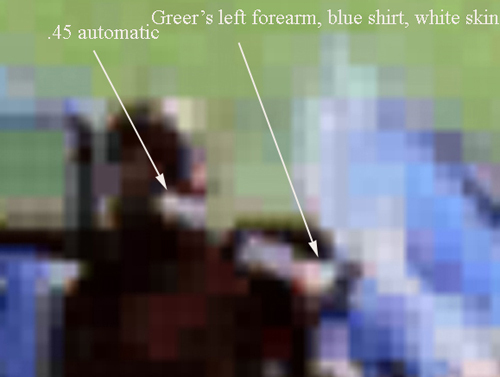 From this photo enlargement you can CLEARLY see the edge of Greer's left arm jacket sleeve, the end portion of his shirt, the flesh of Greer's forearm and his (possibly gloved) hand holding the gun. I used arrows and text in this enlargement to make it abundantly clear that Greer's two hands were not both on the wheel at the moment he was shooting Kennedy. 3. Marrs claims that Cooper was selling "bad" copies ("some were so bad that there was no color") of the Zapruder film which he says that he and Lars Hanson had "warned him not to do so because the claim was false". Right. Well, the truth was quite the opposite. Bill Cooper had obtained a digitally cleaned (computer enhanced) video copy of the Zapruder film from a Japanese source which was FAR superior in clarity and sharpness that anything seen to date by the public. That digitally improved copy was the copy that Cooper included in his hour-long talk that he was selling to the public. After Cooper's death, I found a video copy of the digitized Zapruder film, along with Bill Cooper's hour long narration of the details seen in the film, available on the internet. In that presentation, Cooper includes slow motion clips of a digitally enlarged view of driver Greer turning his head, taking aim, and shooting Kennedy. THERE IS NO QUESTION THAT GREER SHOT KENNEDY. You can see it plain as day in the video! That digital copy in video format allows much greater clarity than the film copy when the speed of the video is slowed down. You can see Greer raise his left hand (holding the automatic), place it on his right shoulder, turn around to take aim at Kennedy, and shoot Kennedy at point blank range-causing Kennedy's head to explode like a watermelon with a cherry bomb inside. 4. The Zapruder film which the public sees today is a version that had been carefully DOCTORED to obscure Greer and Kellerman's roles in the assassination. Critical frames are missing and the order of some frames had been re-arranged. I believe the EXTREMELY critical frame that shows Greer placing the gun on his right shoulder with his left hand had been doctored to obscure Greer's fingers wrapped around the handle of the gun, with his trigger finger inside the trigger guard. If you study the enlarged photo, you can see that Kellerman's "hair" was extended upwards as a square-edged black "box" to hide Greer's index finger in the trigger guard and around the handle of the gun. I posted a long article originally written by Larry Jamison on August 8, 2007 titled "Zapruder Film Shows JFK's Driver Firing Fatal Head Shot"
which includes many still enlargements I made from the Zapruder video of Greer at the moment when he shoots and you can see that Kellerman's hair is standing too HIGH above his head to be his actual hair. The frame was doctored to make it LOOK like it was Kellerman's hair. The government-inspired spin story that Kellerman's "greasy" hair was reflecting sunlight that was mistaken for the gun barrel is utter and despicable nonsense. I'm surprised that Marrs had the Chutzpah to run that one up the flag pole. I also included enlarged stills of Kellerman's head in the above mentioned article and you can see there is nothing unusual about Kellerman's hair: it's neither "slicked down" nor does it stand up unusually high, as the doctored frame would have you believe. Marrs attempts to obviate eyewitness accounts when he postures: "If Greer had shot JFK, someone in the crowd, some less than then 10 feet away, would have said something." but close-as-you-could-possibly-be eyewitness Mary Moorman and Jean Hill both "said something" to the Warren Commission and anyone else who would listen to them. In fact, Mary Moorman specifically said that she saw Greer "shooting back" at what she thought (at the time) was the Kennedy assassin who she assumed was to the rear of the limo. Eyewitness Hugh William Betzner, Jr. , 22 years old at the time, told the Dallas Sheriff's Department in a signed and notarized statement that he saw the President's limo and "another one" were STOPPED. Betzner also said that he saw fragments flying in what looked like a firecracker going off in the car and saw a NICKLE REVOLVER in the hand of either someone INSIDE the President's car or immediatly next to his car. On 3-12-92 I [Larry Jamison] interviewed one Fred Newcomb, who researched, along with co-author Perry Adams, a book entitled "Murder from Within," © 1975 derived from original research done in Dallas in 1968 when the memories of witnesses were still fresh. Mr. Newcomb felt his book made the case for the limousine driver shooting JFK so well that he sent copies of the book to the 1975 Congress and Senate because he felt he would be guilty of "obstruction of justice" if he did not do so. These are the witnesses whose statement to Mr. Newcomb and sometimes the Warren commission included the words "in the car." 1. Mary Moorman - school teacher standing next to Jean Hill. She said she saw Greer shooting back but thought he was shooting back at the assassin. SOURCE: Warren Commission and taped interview by Fred Newcomb. 2. Jean Hill - Jean Hill saw what happened too, but when she tried to bring up the subject of a gun being fired in the car, Senator Arlen Specter (a 33rd degree Mason) would change the subject or say "it's time for a cup of coffee." 3. 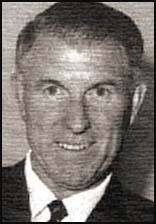 Austin P. Miller - Texas Louisiana Freight Bureau, who stood on the railway overpass overlooking Elm Street was asked by Arlen Specter where the shots came from: His reply was "from right there in the car." Senator Specter just went on to the next question, never asking Miller any specifics. From: Warren Report, New York Times edition, p. 82. 4. Clinton J. Hill. Jacqueline Kennedy's bodyguard reports in Vol. II, pp 138-139 of the Warren Commission Volumes: "I jumped from the car [the Secret Service agents car immediately behind Kennedy's limo], realizing that something was wrong, and ran to the presidential limousine. Just as I reached it [and jumped onto the back of the President's limo grasping the square black handle sticking up from the trunk], there was another sound. I think I described it in my statement as though someone was shooting a revolver into a hard object...it seemed to have some type of echo." 5. 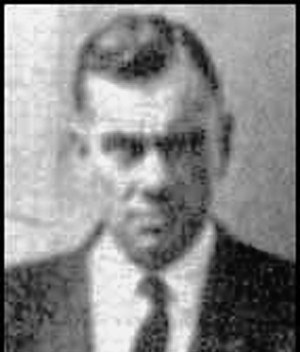 Hugh William Betzner - Had picture published in Life magazine and was standing right next to the drivers side of the motorcade: He saw a gun in the hand of one of the secret service agents and heard a sound "like firecrackers going off in the car." Link to Betzner’s official statement: http://www.jfk-online.com/betzner.html Source: taped interview with Fred Newcomb. 6. Senator Ralph Yarborough - 3rd car back "Smelled gunpowder in the car." (statement made to press but not to Warren Commission) He was challenged by Newcomb on the phone and he then said "I must have smelled it coming down from the book depository"
It's so gratifying to read that Nellie Connally, who Marrs "knew personally, would have talked, at least as gossip", if she had any inkling that a gun was fired from within the limo, but I stopped living in a make-believe world when I was a child and became accustomed to dealing with human frailty as it actually exists. More significantly, I have a better source of Connally testimony than Nellie Connally: I have the words of John Connally himself who told his nephew, when asked, that it was the driver, Greer, who shot Kennedy. I posted a Letter to the Editor on Jan. 26, 2009 that was titled: "Connally's Nephew Confirmed that JFK was Shot by Secret Service Agent Driving the Limo"
You may consider this additional validation of the "driver-gunman theory." My brother met the nephew of Governor Connally [THE one who was also shot while in the car with JFK], and one day the nephew asked the governor, his uncle, "Who do you think shot Kennedy, uncle?" and Governor Connally said, without hesitation, "It was his driver who shot him." Hmmm...from the mouth of one who was IN THE CAR, along with numerous eye-witnesses who said [in effect] "It sounded like firecrackers were going off IN the car," that's a pretty convincing testimony! I've watched numerous versions of the Zapruder film, and in some you can [fairly] clearly see the driver turn, and with his LEFT hand, over his right shoulder, shoot a pistol at Kennedy, turn back and speed away! Think of the "magic thumb" trick magicians pull, when they stuff the handkerchief "into their hand", and it disappears! It's a BIG, hollow thumb you NEVER LOOK AT, because your attention is diverted--classic misdirection! In all of my years, I never looked at the driver, [in the Zapruder film] because I was too distracted by JFK's exploding head, and Jackie climbing onto the back of the car! WHY would he [the driver] BRAKE "in the kill zone", TURN AROUND, TAKE HIS [left] HAND OFF THE WHEEL, WHILE LOOKING BACK, and THEN speed away, ESPECIALLY if he was a "chauffeur by trade"? In some versions of the film, it's jerky, and you can't see this action the driver makes, as it's been removed, like you can in other versions. But I have seen it, and those who have examined the evidence of the damage to JFK's skull say it "could have been done by a handgun at close range." So...I don't care what the Discovery Channel [controlled media] says, when there is OVERWHELMING evidence, especially of the "Zapruder film" being altered [I'm quite knowledgeable on photography, former photo major with many years in photography/film], and the film HAS been doctored. Greer and Kellerman's "work" (for the CIA) did not end with the shooting of Kennedy. The Jamison article I posted on August 8, 2007 goes on to explain the role that Greer and Kellerman played at Parkland Memorial Hospital to covertly remove Kennedy's body to be "fixed up" at a secret CIA lab faciltiy and the substitute loading of a dummy Kennedy coffin for the highly publicized flight back to Washington.